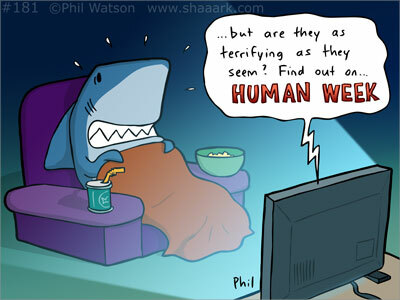 While Shark Week came and went, and highly talented cartoonist Phil Watson http://www.shaaark.com/ shark cartoons, got me laughing again when he put Shark Week right into perspective with this so true cartoon (I’m a huge fan of Phil’s work! ), I’ve had a crazy two weeks. I’ve gone through 2 computers: my main computer’s harddrive crashed, and then I spilt a glass of red wine right into the keyboard of my MacBook! And I burnt the kettle out while trying to make myself a cuppa tea to calm down! The good parts were the talk I gave last week with Clem Sunter, former Anglo American Chairman, and preparing for a talk I will be doing tomorrow at the first TED conference event in South Africa called TEDx, to be held in Stellenbosch. The whole TED talks idea started in 1984 as a conference held in the USA with the aim of bringing together people from three worlds: technology, entertainment, and design but has since broadened its scope to include topics on science, business, the arts, and here’s where I come in, the global issues facing our world. Everything begins with an idea, ideas control the world but rarely are they tested openly. TED believes that for ideas to impact the world, develop into innovations, ripple through communities and spread between cities, we need to tell our stories. TED is thought of as a global community which welcomes people from every discipline and culture who have just two things in common: they seek a deeper understanding of the world, and they hope to turn that understanding into a better future for us all. What an awesome talk. Carefully crafted, you stuck meticulously to the time limit, which was obviously a huge challenge, given the complicated nature of your subject. To have been selected to be one of the eleven speakers at this first TEDx conference in SA is in itself a great honour and a deserved tribute to your tireless work. However, your amazing performance in front of 550 people was mind blowing. How you remembered every word of your carefully crafted speech remains a mystery and the passion with which you delivered it in complimenting your outstanding photographic footage and images puts you in a different league to many other conservationists, locally and abroad. You are a National asset and i am proud to know you and work with you.Yes, with performances like that, we can change the world.